It’s easy to overlook cleaning and polishing your shoes, especially if they don’t look worn. While some may find the act of sitting down, cracking open a tin of polish and working the leather of their shoes relaxing, many people find it hard to dedicate the time to a task that they feel isn’t necessary. Well, we’re here to tell you that not only is shoe polishing necessary, it’s the best way to ensure that you get the most out of your favorite pair of designer shoes. Your shoes will feel more comfortable, look better and – most importantly – last longer if you regularly set aside time to clean and polish them. 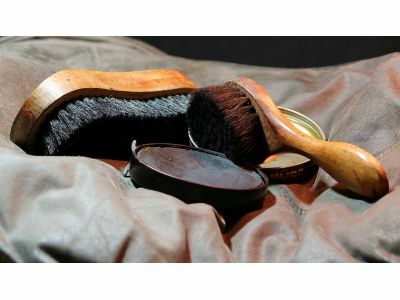 In this post, we’re going to cover the basics of shoe polishing and, hopefully, convince you of how important it is to the life of your shoes. Why is shoe shining so important? Just like waxing your car, polishing your shoes helps to protect them against the elements. In Michigan – with our propensity for rain and snow – this is critical to ensuring that your shoes last a long, long time. Without regular polishing, conditioning and treatment, the leather of your shoes will break down, resulting in even greater exposure to caustic elements that, ultimately, will lead to irreparable damage. How often should shoes be polished? In most cases, polishing your shoes once per week is a good rule of thumb. Of course, many people can get away with longer stretches of time in between shines, especially if they aren’t wearing the same pair of shoes multiple times during the week. How long does a good shoe shine take? For the average pair of shoes, a good ten minute shine will suffice. Naturally, if you want a spotless mirror finish, it may take a little longer. And, if you only need a quick conditioning, it could be a little shorter. The important thing is to thoroughly apply your conditioner and polish to ensure that every part of your shoes receives the care – and protection – that it needs. At Corey’s Bootery, we are Kalamazoo’s premier shoe repair experts. If you have concerns about conditioning, polishing, repair or cleaning, our professional staff is standing by, ready to assist. To discuss how we can help you extend the life – and your enjoyment – of your shoes, contact us today!